It’s getting harder and harder to realize the American dream. Nearly half of all Americans live paycheck-to-paycheck. Roughly 46 percent of Americans can’t raise $400 in an emergency. Meanwhile, the costs of college tuition and healthcare continue to increase while real wage growth was just below 0.2 percent in 2017. In short, my answer was no. It would take significant changes in the economy, tax policy, healthcare, immigration, minimum wage, the Earned Income Tax policy, etc. to truly rekindle the American dream. 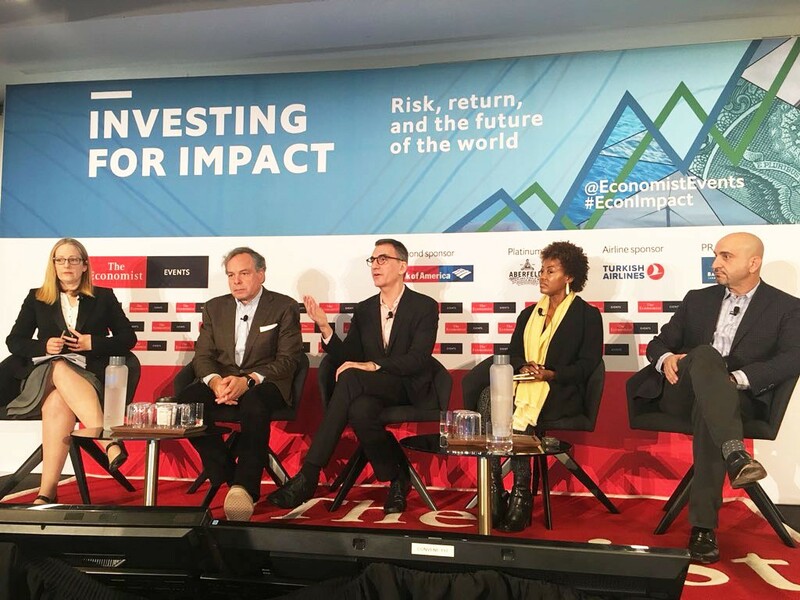 But with a small amount of editing, we re-titled the panel to ask ‘Can Impact investing help rekindle the American dream?’ The answer to that question was a resounding yes! Every panelist had a different way of thinking about the question and using impact investing to help more Americans or drive progress in a given sector. I described some of the trends we’re seeing and the exciting innovations in new ways to help meet the financial needs of people who, for too long, have been left out. These changes can make a more inclusive financial sector that benefits more people. Americans need basic financial tools to help them seize opportunities, endure shocks, and manage their day-to-day lives. In 2015, 45 million Americans had no functional credit score. 60 percent of Americans have less than $500 set aside. And it’s still significantly harder for women, new businesses, and legal immigrants to take out a loan. Kesha pointed to the differences in black and white wealth: the typical black family would need more than 200 years to build the wealth of today’s typical white family. We spoke about how there’s much the USA can learn from abroad on this front. The most effective thing way can do to promote financial inclusion in the U.S.A. is for our government to make it a priority. Many other countries have cabinet-level ministers dedicated to addressing this issue as well as national programs promoting financial inclusion. Here, we rarely admit financial exclusion is a problem worth solving, let alone how to fix it. Look at India: its government added more than 300 million formal accounts to its financial sector; provided 99 percent of its citizens with a biometric-encoded identification card and a unique number that they can use to bank electronically through a unified payments interface; and even removed some currency notes from circulation to encourage more digital commerce. India’s government helped the country become a hotbed of fintech innovation; the steps that it took provided startups with the tools, data, and delivery channels they need to build thriving businesses that provide financial services to the underserved. But the country didn’t invest in any new models directly, nor does the government manage new companies. Instead, policymakers created the conditions needed for those businesses to flourish. By calling for a national financial inclusion program here, we could drive similar progress. We should be looking to the rest of the world for solutions and import the ideas that would make the biggest difference. For instance, America’s small businesses could benefit from new regulations in Latin America: Brazil, Mexico, Chile, and other Latin American governments now require merchants to use electronic invoicing. Originally intended to promote tax compliance, this measure generated a rich new stream of data that lenders can use to assess a business’s needs. If we were to do something similar in the U.S.A., mom-and-pop stores would be more likely to obtain the financing they needed to expand, restock their shelves, or hire more workers. There are global solutions that we can use to begin rekindling the American dream. We’ll continue searching for and cultivating the best ideas and working to ensure that everyone has the tools they need to build better lives.